Tuesday haiku – not for arachnophobes! Catching flies in my garden. Yes, it’s that time of year when I can’t go out in the garden without breaking up the happy homes of many different types of garden spider. Fortunately we don’t have any poisonous ones here in the UK – except for the refugees from boxes of imported bananas that have found a conducive home somewhere. Black Widows in ventilation shafts are just one example. The picture above is the spider I have to work around to collect my ripe tomatoes. The one below is of a couple of webs – the blur in the centre is a different type of spider, the one top left is a regular garden spider like the other one. I saw the light through these webs earlier but took the pics at dusk, hence the flash on the web and the sky showing darker than it actually was. The yellow flowers are rudbeckias or cone flowers. While I was taking these photos, a toad clambered into the growbag where my tomatoes and cucumbers have produced good crops – especially the cucumbers this year. We’ve been self-sufficient in cucumbers since mid July – which, considering my guinea pigs insist on a slice each, morning and evening, is quite something! I’m still hoping the last one will fill out a bit more – but it’s getting a bit cool for it. I made my first batch of this year’s home-grown tomato soup at the weekend. Yum! 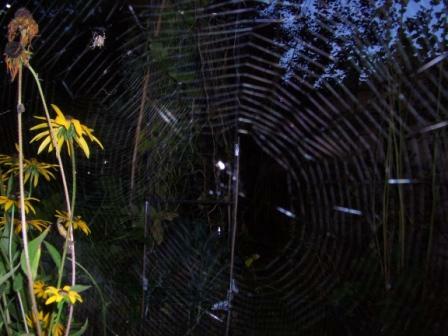 But of course the spiders in the garden are just. . . garden-variety spiders. The black widows hide in the corners of the garage. Ugh. I come from a place like yours–with no poisonous spiders or snakes. Nearly 25 years in California and I still freak out a bit. Without something to compare it against the top spider looks massive. I don’t think I’ll be popping round for tea and tomato sandwiches anytime soon Jemima. lol It’s just an ordinary one, about half inch body, one inch (2.5cm) overall. The ones in the house can get quite interesting (2-3 inches across), but they do a grand job in catching flies. I hate flies. But I don’t like it when I walk into them by accident! I love to watch them spinning and pull them out of the pool on a regular basis just because they keep the insect population down. We have some huge ones here – biggest I’ve seen is about 3″ across. I don’t like walking into them either, but always feel sad when I destroy something it took them hours to create!